Over 150 species of coral makeup the centerpiece of sanctuary marine life, which also includes over 1,400 species of other invertebrates and a wide variety of algae, several seagrasses, humpback whales and over a dozen other species of whales and dolphins, hundreds of fish species, over 30 seabird species, and hawksbill and green sea turtles. 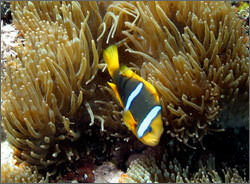 Fagatele and Fagalua/Fogama’a bays are part of a distinct biogeographic region that is a hotspot for coral cover, coral and fish species richness, and Fagatele Bay has the highest macroalgae species diversity, and may have the highest percentage of live coral cover around Tutuila Island. These bays are also home to schools of damselfish, surgeonfish, butterflyfish, parrotfish, grouper and snapper. 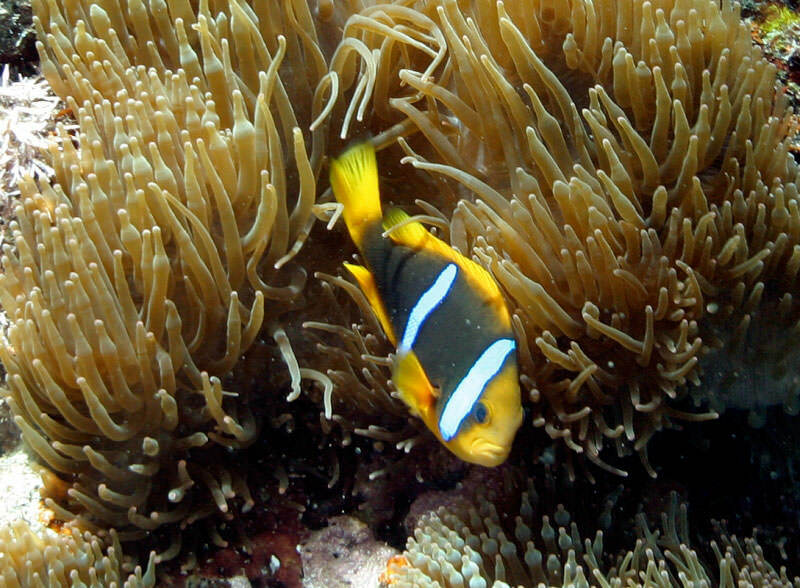 The area surrounding Aunu’u Island has a unique fish community, and overlaps with four distinct biogeographic regions making it a highly diverse marine area that includes hot spots for coral cover, fish biomass, and fish richness. Aunu’u’s Nafanua Bank is known for its coastal pelagic fish including dog-tooth tuna, giant trevally, and rainbow runner. 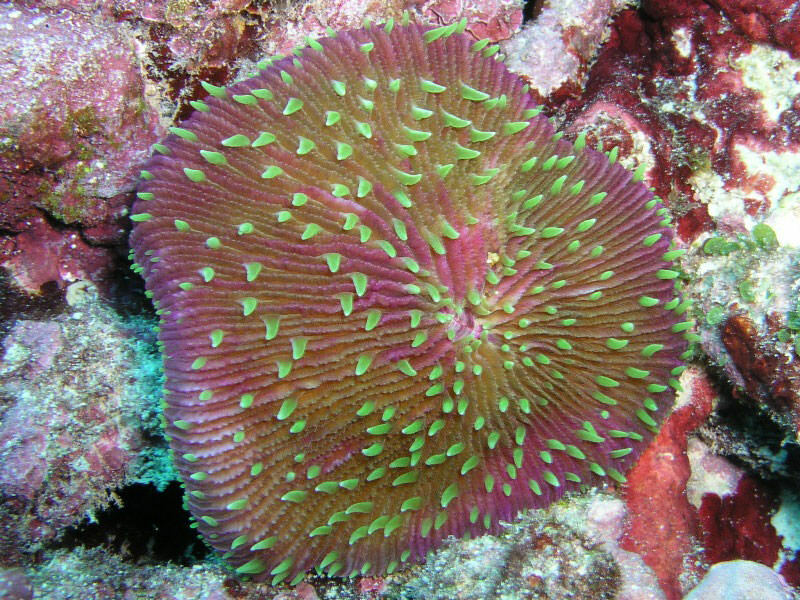 Sanctuary waters at Aunu’u also include a vibrant patch reef system, and a coral shelf that provides a continuous habitat that extends down to mesophotic reefs (deep water reefs typically found at 30 to 150 m depth in tropical regions). The sanctuary’s coral reefs at Ta’u Island include massive Porites coral heads that are among the oldest and largest known in the world, with one colony measuring 23 feet (7 m) tall and 135 feet (41 m) in circumference! 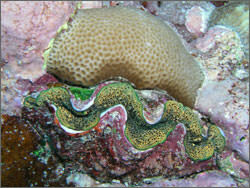 The western side of Ta’u Island is a regional hotspot for coral and fish richness, possesses a distinct coral community, and shelters a large population of giant clam. 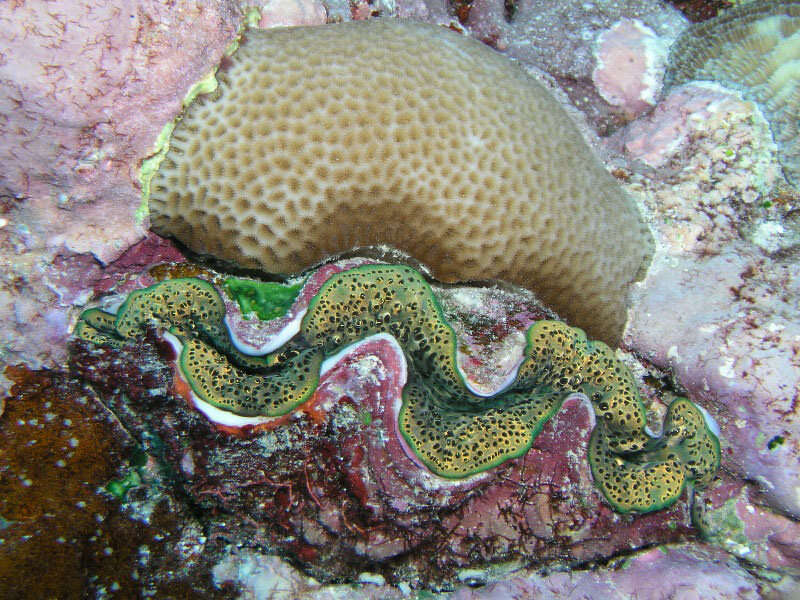 Rose Atoll is a distinct bioregion within the archipelago, is a hotspot for fish biomass, has unique coral and algal communities, supports the highest densities of the giant clam Tridacna maxima in the Samoan archipelago, and is the primary site for green turtle nesting in American Samoa. The Vailulu’u Seamount has a diverse biological community that includes polychaetes, crinoids, octocorals, sponges, and a population of cutthroat eels. The pelagic marine habitats around Rose Atoll are representative of the largest ecosystem on earth and the least well protected. 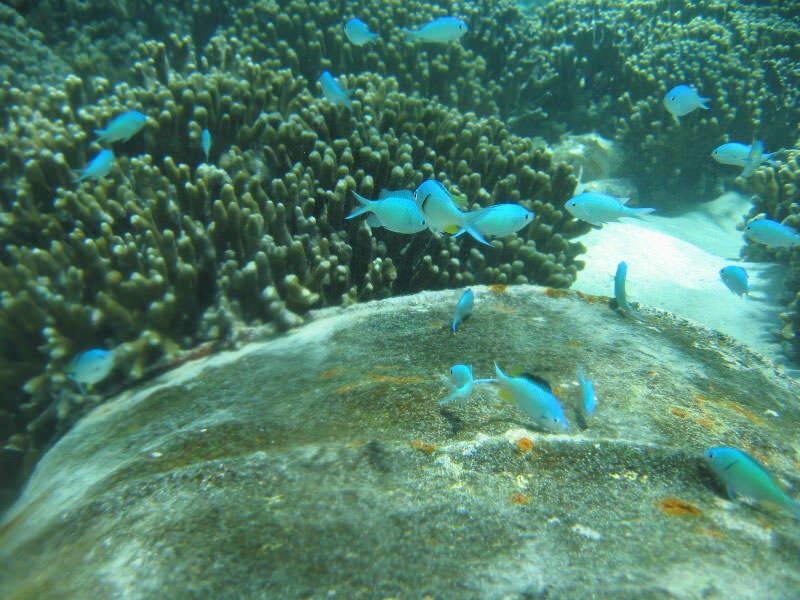 Swains Island is a hotspot for coral cover, fish biomass and fish species richness. Its large fish biomass is high, with large schools of predators such as barracudas, jacks and snappers. Sharks and schools of humphead wrasse are frequently seen in Swains’ nearshore waters, and dogtooth tuna are more common here than anywhere else in American Samoa. The sanctuary plans to develop and implement ecological and environmental monitoring of both shallow-water reef and deep water habitats for all sanctuary areas. These efforts will facilitate improved qualitative and quantitative descriptions of the sanctuary’s marine life. As part of the homeland of Polynesia’s oldest culture, American Samoa contains maritime heritage resources representing more than 3,000 years of human history, and the sanctuary is legally responsible for helping protect and preserve those resources within its boundaries. Maritime heritage resources consist of cultural, archeological, and historical properties associated with coastal and marine areas and seafaring activities and traditions. In American Samoa, these resources reflect five different aspects of Samoan history: archaeological sites; marine and coastal natural resources associated with American Samoan legends , folklore, and culture; historic shipwrecks; World War II naval aircraft; and, World War II fortifications, gun emplacements, and coastal pillboxes. There has been no systematic field survey either by divers or by remote sensing methods directed at maritime heritage resources in American Samoa. Hence, much more remains to be learned about the wealth of prehistoric and historic maritime heritage resources here. Toward that end, the sanctuary’s 2012 management plan includes a Cultural Heritage and Community Engagement Strategy (#4) outlining plans to inventory, assess and protect maritime heritage resources within the sanctuary and broader American Samoa. Known resources are highlighted below. Fagatele Bay’s shores were the site of a historic coastal village occupied from prehistoric times through the 1950s, and the bay contains one of the few marine archaeological records in the territory: grinding holes or bait cups carved by Ancient Samoans into the shoreline along the reef edge. Fagalua cove is the site of two turtle images carved in a boulder and prehistoric fale (a traditional Samoan house) foundations, and may contain buried archeological deposits. Ceramics and potsherds indicate that people were on Aunu’u Island as long as 2000 years ago, although not much is known about the settlements at that time. This island is also the site of a whaling vessel lost at sea in 1835, and of ruins once used to hold the four cannons from the Kaimiloa, a Hawaiian Kingdom steamer that was sent on an 1887 voyage in a display of power. The cannons were used by the people of Aunu’u to repel a canoe fleet invasion and are now on display at the Jean B. Haydon Museum in Pago Pago. Other resources at Aunu’u include several sites associated with legends, buried archeological deposits, wetland taro fields likely of prehistoric age, and remains of an old light beacon. Ta’u has 82 known historic properties island-wide, including prehistoric villages, star mounds (large, star-shaped, raised platforms associated with the activities of higher ranking individuals), legend sites, wells, fish bait cups, petroglyphs, and buried archeological deposits. One particularly culturally significant site at Ta’u is that of Taisamasama, off the southern coast of the Island within the National Park of American Samoa (excluded from the sanctuary). Varying legends explain why the waters offshore from Taisamasama have a yellow hue, including that it results from a historical Kava ceremony between significant Samoan chiefs. There are a number of maritime heritage resources at Rose Atoll within and outside of sanctuary boundaries, including: a Navy survey marker, a Naval Administration era concrete monument from 1920 posting American Samoa’s claim to the atoll, an old fale foundation likely used by a family that briefly had a copra plantation on the island in the 19th century, and three known late 19th century shipwrecks. Archeological surveys have not been conducted at Swains Island, but it likely holds prehistoric sites and buried archeological artifacts. In addition, it may have some tupua (legendary, sacred stones, rocks or formations that represent ancient Humans), and some buildings on the island may be historic. Many of these links take visitors to outside web sites. Links to non-Federal Government Web sites do not imply endorsement of any particular product, service, organization, company, information provider, or content. Web Site Owner: National Ocean Service indicates a link leaves the site. Please view our Link Disclaimer for more information.